Let's start with the easy part. As always, clear the pistol and ensure no live ammunition is in your workspace then proceed with a standard field strip. 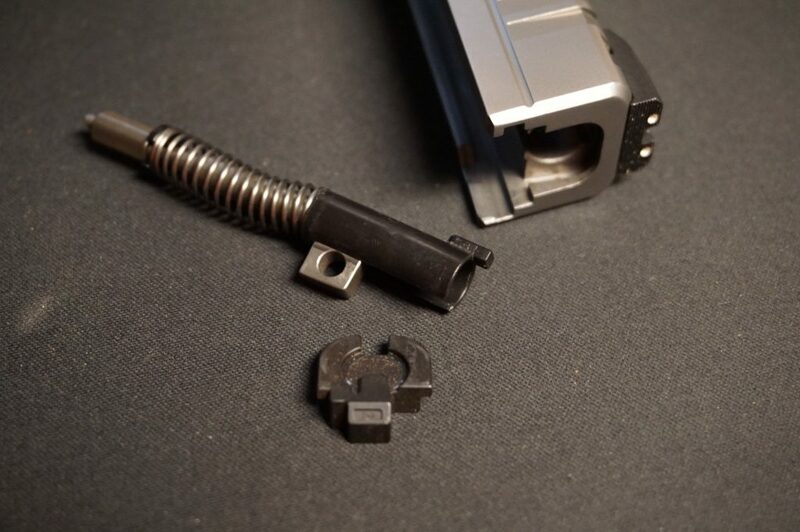 Lock the slide back, flip the lever up, dry fire to remove the slide and separate the barrel and recoil spring. Easy stuff. Basic field strip, the first step on every gun adventure. Also add a 1/16" punch for the slide full strip! Remove the striker retaining backplate. Press in the little tab and pull the plate down. Watch for spring pressure! Striker assembly should look familiar to most gun owners. 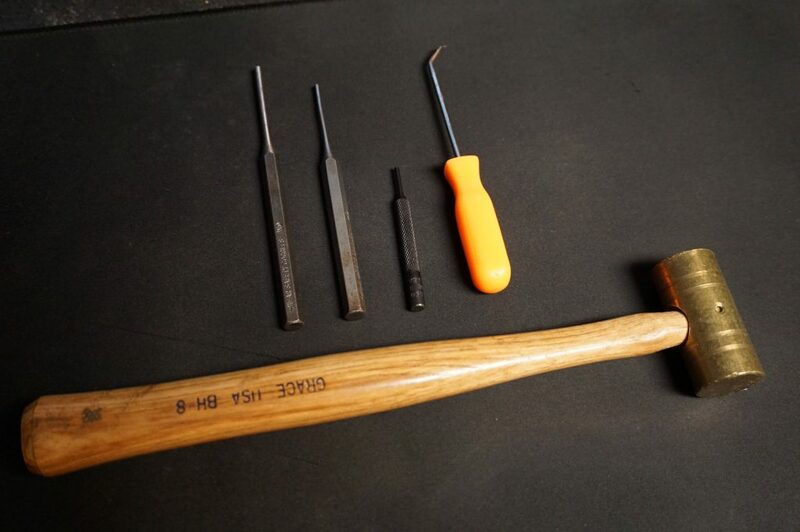 Disassemble the striker assembly. 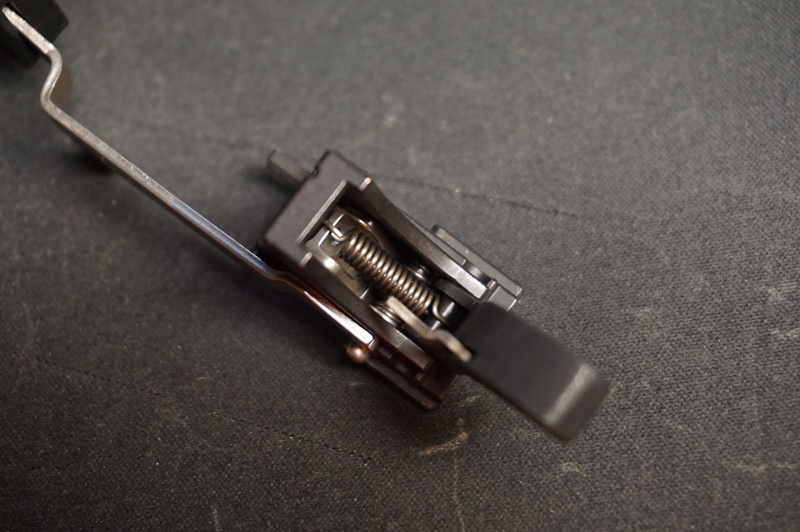 You can use the slide as pictured as a backing to pull the spring down, remove the collar, and everything comes apart easily. The old slide trick applies to lots of pistols. Remove the loaded chamber indicator. I would recommend driving this pin out RIGHT to LEFT. If you do the opposite like I did, the slightly peened over left side smooths over and the pin won't stay in. Easily fixed with a quick bump on the anvil though. LCI is straightforward, and does get dirt under it! Take out the extractor and striker block plunger. Drive the roll pin out either direction (I recommend bottom to top) and pull it out. The striker block plunger is retained by the extractor, so it'll take off if you just yank the extractor out. Don't lose the interesting little spring buffer... filler... stick thing. Extractor roll pin is tiny! 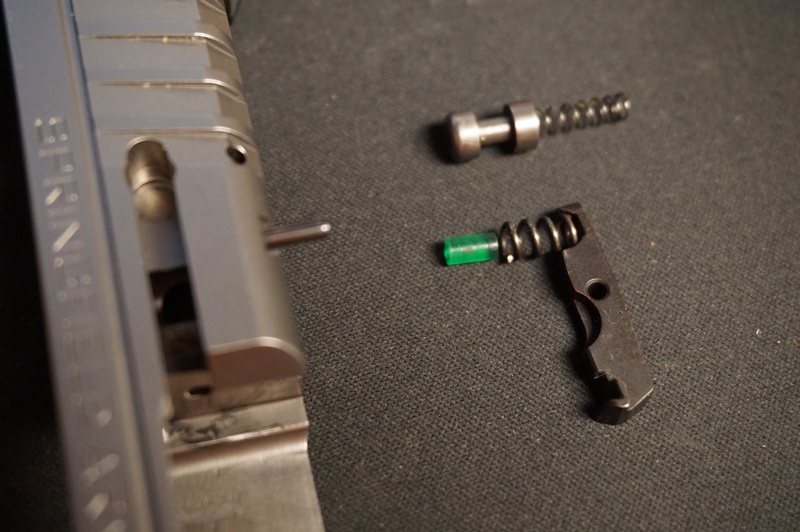 Extractor, spring and buffer, and the striker block. 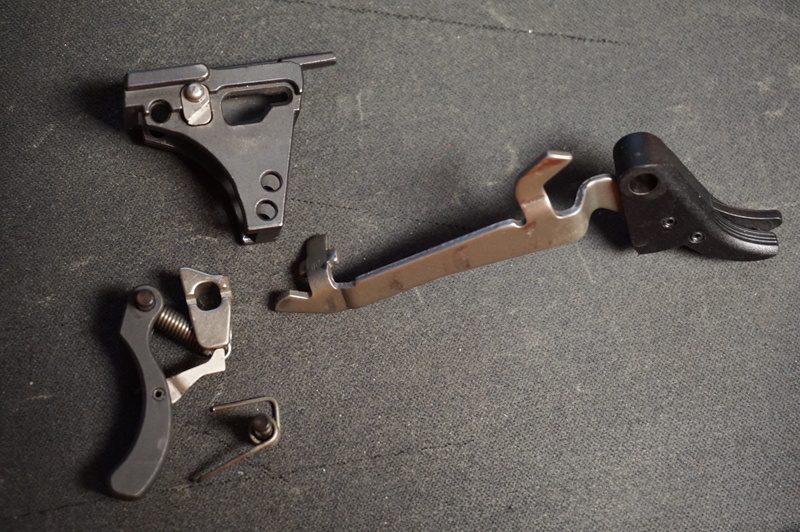 Reassembly tips: Not a lot to say here, everything goes back together easily enough in a straightforward order. 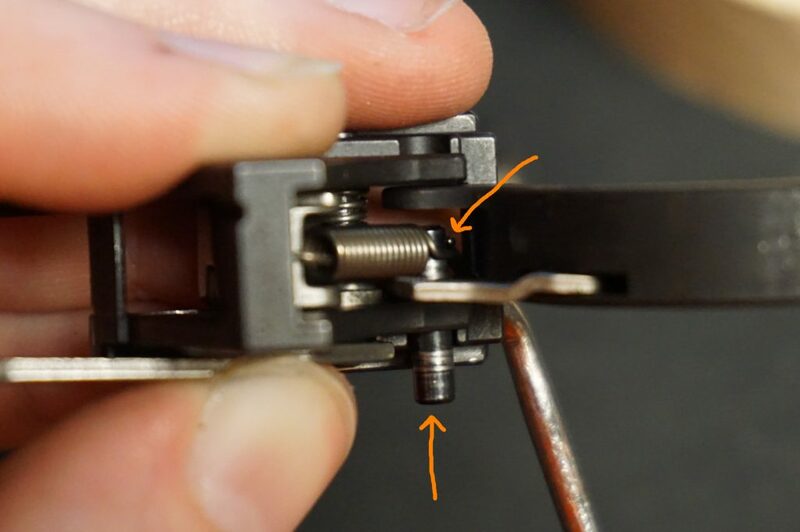 Just keep in mind the LCI lever's pin needs to be friction fit, so you might need to peen the end a bit to keep it snug. Or just don't remove it unless you need to cerakote the slide! Time for the fun part! The XDS doesn't have too many fiddly bits or tiny springs, but you will have to fish around with a pick to get the sear spring back in place. A hook or pick is really handy in general on this gun for the couple of springs you do need to mess with. Remove the takedown lever. From the vertical takedown position, rotate it slightly counter-clockwise and pull on it, it'll come right out. Some additional wiggling may be required. Another familiar arrangement in modern pistols. Remove the locking block group. 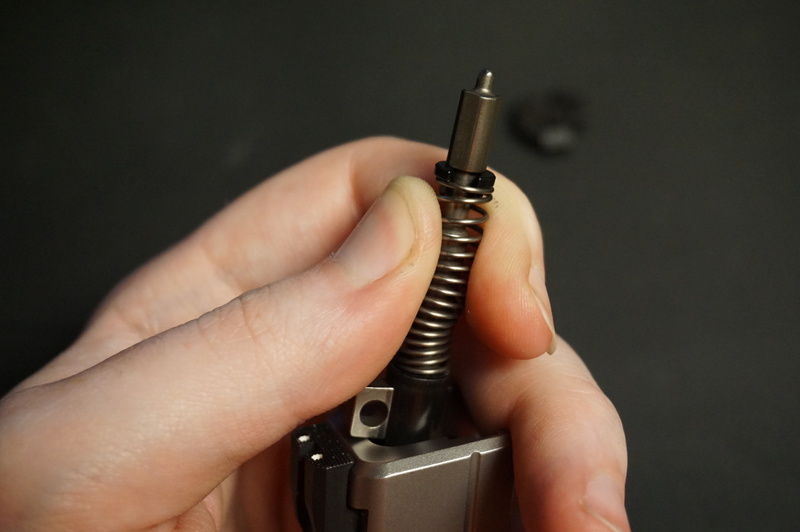 Drive out the trigger pin (large diameter) and the reinforcing pin (small diameter) left to right. The locking block will lift out, bringing along with it three more pieces: the slide stop, slide stop spring, and an odd stainless piece I'll discuss later. Pins pins pins! Front to back seems to be a good strategy. That's a funny looking spring. 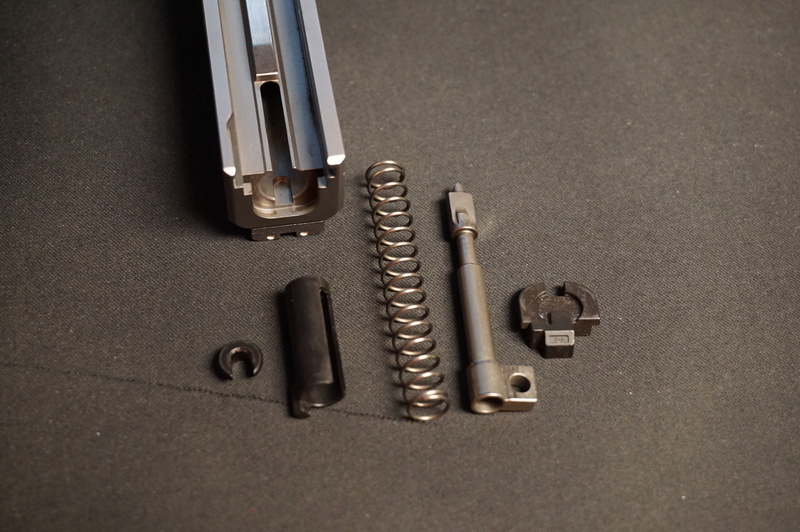 Locking block, slide stop, spring, and... what is that anyway? Remove the ejector and sear housing. 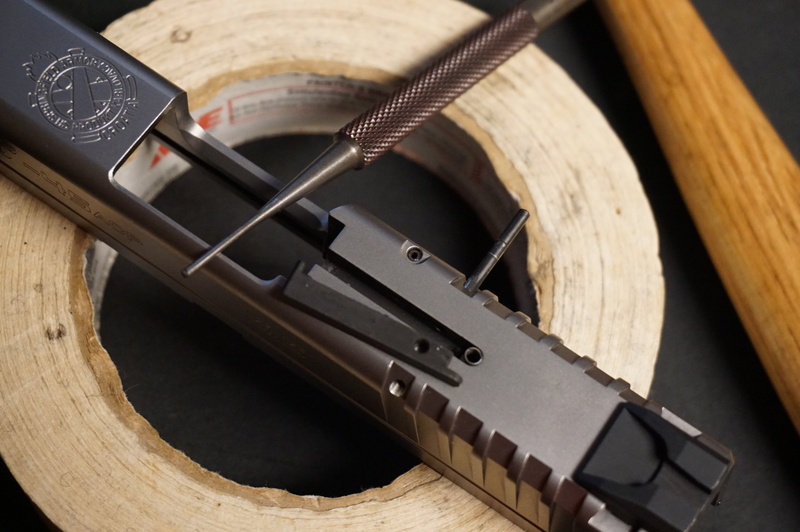 Drive out the roll pin in the back of the grip and CAREFULLY lift out the assembly. 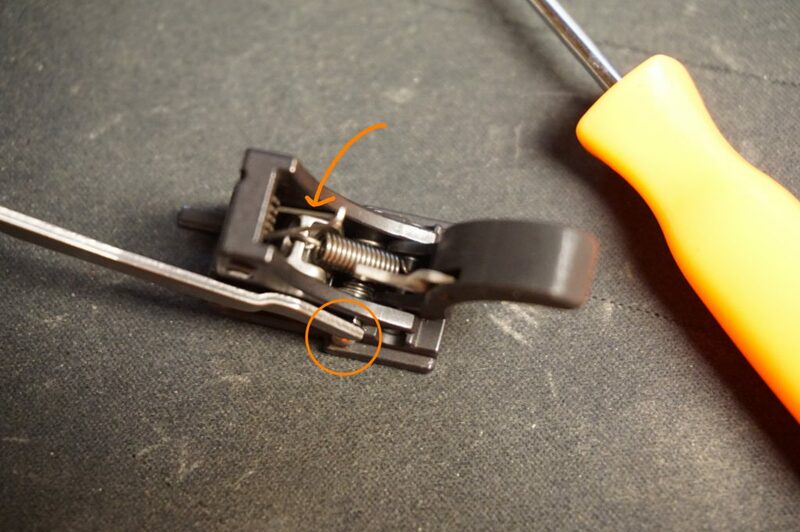 If you're doing this for the first time, maintain pressure on the grip safety so you can take a close look at the spring and grip safety lever before it relaxes and things try to fall apart on your bench. Take out the sear and grip safety spring. The pin probably already fell out, to be honest. The L bent leg goes into a slot on the bottom of the sear, while the long curved leg is what spring loads the grip safety. Loose pin and two function spring. Remove the grip safety. Another easy pin, but this one has one end of the sear's pull-spring looped around it. Yep, that's going to be fun to get back together later! Upside down view of the sear spring arrangement. Lift off the trigger bar. 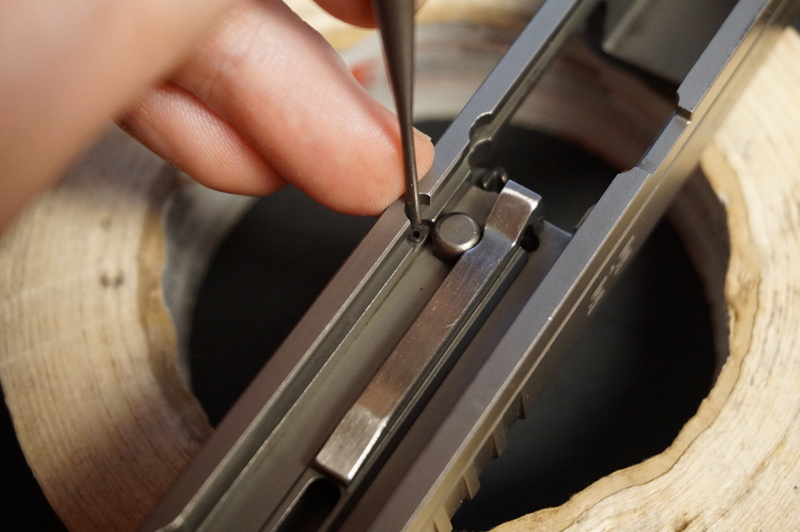 The trigger bar slots into a cut in the sear and will lift right out once the spring is freed up from its pin. The sear will fall out, with one side of its spring attached via a loop. Leave the disconnector and sear cam alone. I actually never came up with a good way to remove this thing, and there's no real reason to. Magazine release. Another part I don't recommend messing with, but if you have to do it you'll be in for a fight reassembling it due to the spring. Drive out the tiny pin above the release button and it'll pretty much fly apart on its own. One pin and a very stubborn spring. Reassembly tips: Oh boy, where to start with this one? Let's work in reverse. 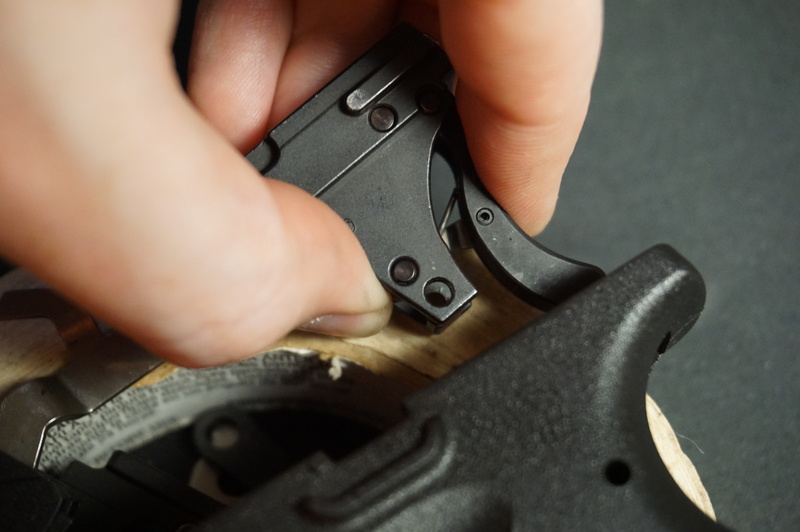 Reconnecting the sear spring and install the grip safety. This is best done upside down, starting the grip safety pin from the right side of the assembly (or the side facing you, since it's upside down) while using a pick to loop the spring over the partially inserted pin. A pick, patience, and lining things up. Reassembling the ejector and sear housing into the frame. Best practice here is to actually push the disconnector peg in and let the trigger bar go as far rearward as possible, this allows the sear to align properly with the grip safety's little blocker leg. Another upside down job here, turn it over and get the blocker leg lined up so it rests under the sear (see images later for reference on how it works) then tension the spring over and press the grip safety in to hold it. Once it's all in the frame it stays put, thankfully. Reassembling the locking block group. 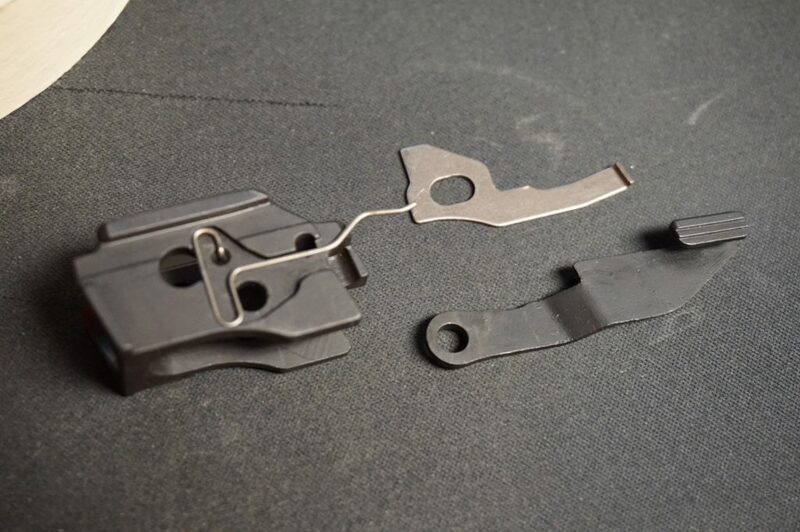 The key parts here are to put the anomalous silver piece in its shaped cutout on the right side of the locking block, drop the whole thing in part way, then slide the slide stop in and sneak it under the spring. The slide stop actually goes on the INSIDE edge of the locking block, not on the outside like the other piece. Again, a pick is handy for nudging the spring keepers out of the way so you can get the trigger and reinforcing pins through easier. Slots right in, just sneak the slide stop under its spring. Takedown lever. There's a cutout meant to cam the spring keeper out of the way, then just push it straight in so it lines up. A little wiggling and thumb pressure will click it into place with the slide stop spring retaining it in a tiny cut on the lever. 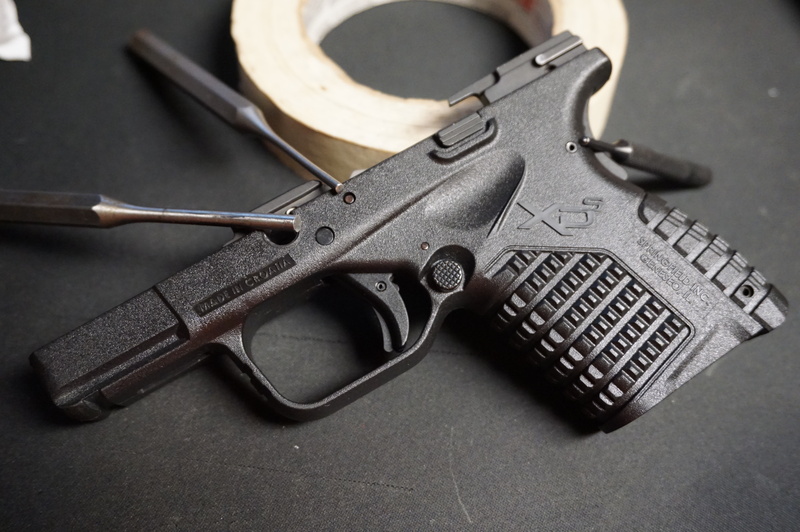 There are a couple of small points I want to touch on, the first of which is the grip safety and how it works. 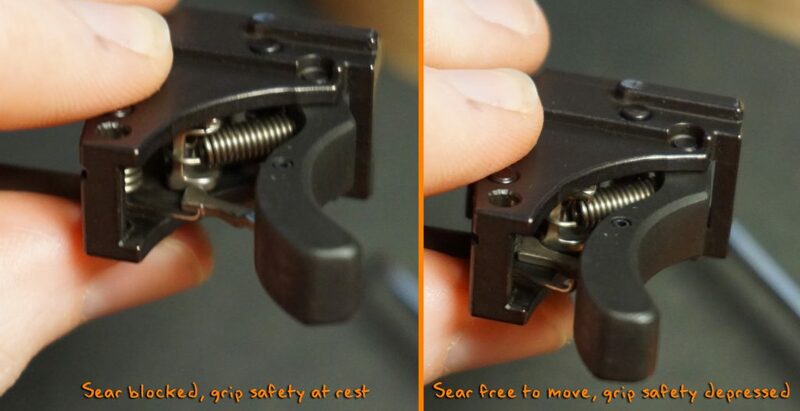 It's a sear blocking grip safety, rather than a trigger or trigger bar blocker, which is actually rather clever. 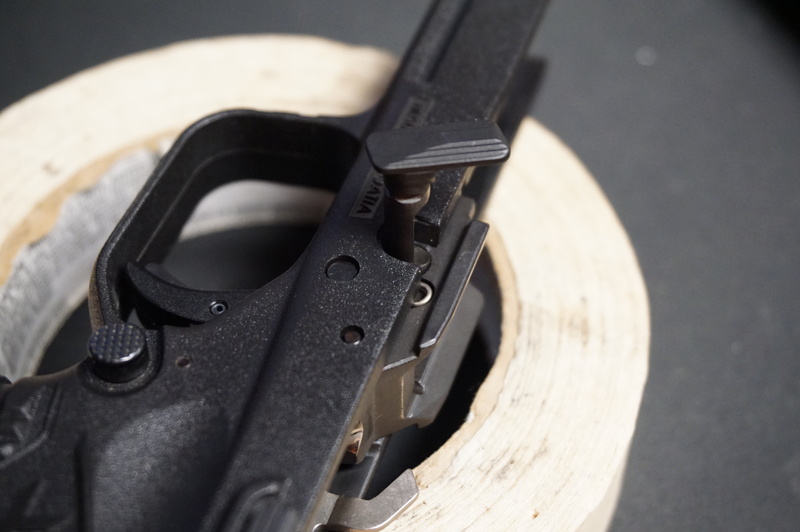 It's also extremely simple, and consists solely of a small steel piece pinned to the grip safety so it can move forward and backward as the grip safety is depressed or released. The leg has a raised portion that blocks the sear's downward motion, preventing the striker from being released, then the blocker leg drops off so when it moves forward (grip safety pressed in) the sear has room to move into the empty space. Simple and effective sear block. Another clever design is the trigger bar cam and disconnector. 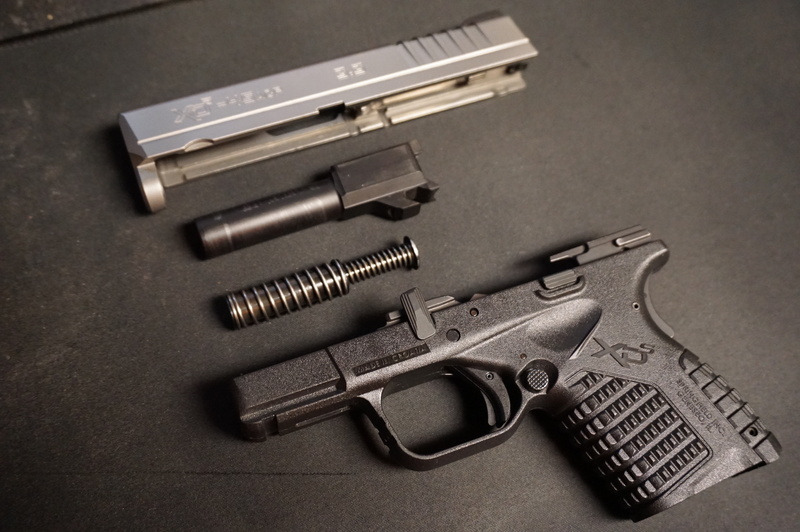 On Glocks, the trigger bar cams off of the trigger connector which is simply a stamped steel piece fit into the ejector housing. 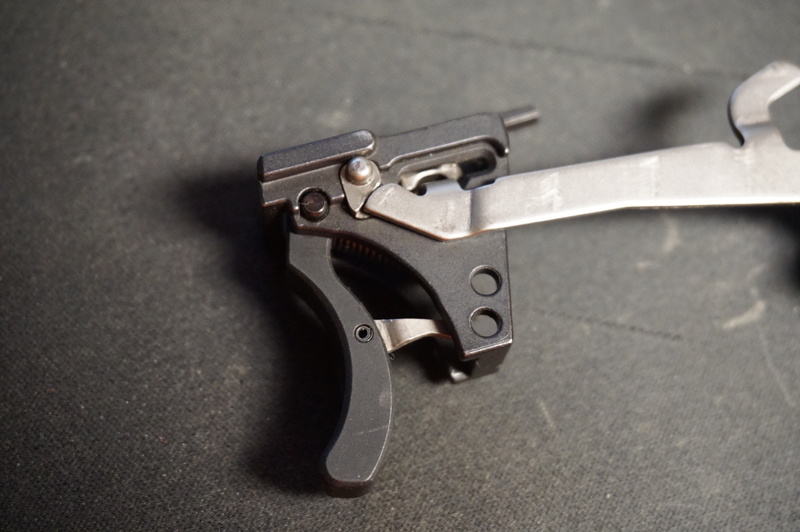 Smith & Wesson uses a discrete sear cammed by a loop on the trigger bar, and disconnected by horizontal motion of the trigger bar via a track in the slide. The XDS however combines the disconnector and cam into a single spring loaded plunger that sticks out of the ejector housing into the path of the slide rail. 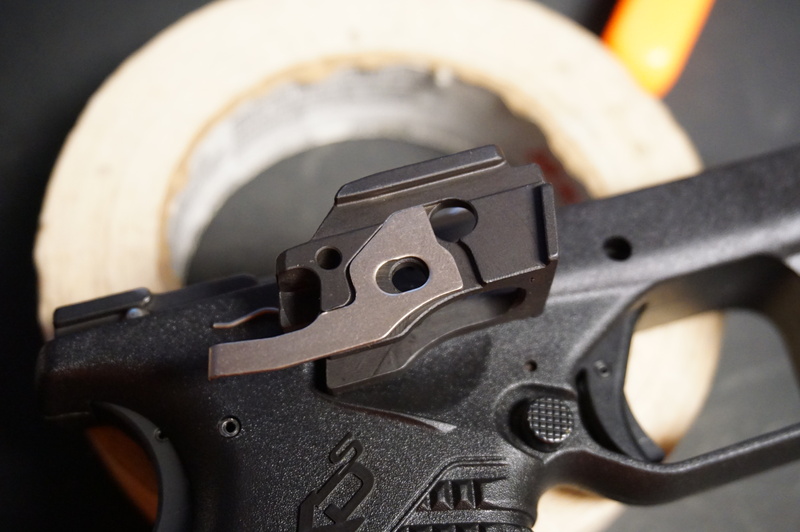 When at rest and spring loaded outward, an angled block extends into the path of the trigger bar to cam it downward and drop the striker. 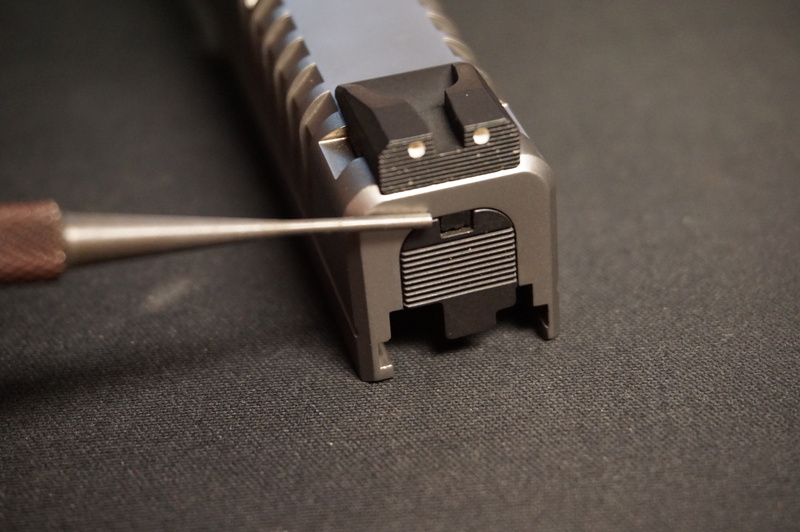 When the slide cycles, it bumps the little round peg and pushes the disconnector into the frame, which allows the back of the trigger bar to pop up, carrying the sear with it, into position to catch the striker. 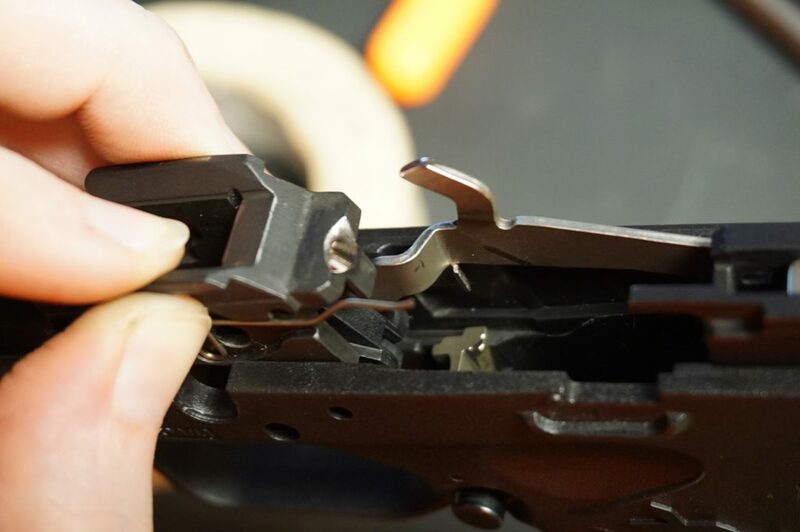 Releasing the trigger then allows the disconnector and cam to pop back outward, ready for the next trigger pull. 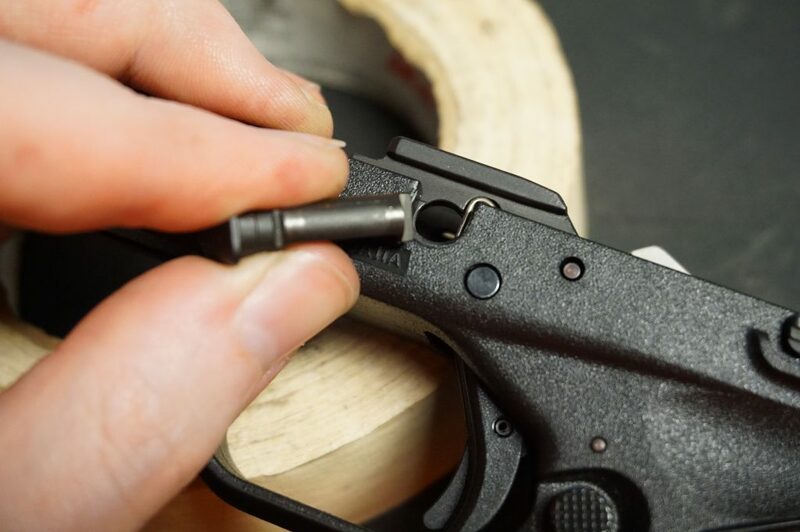 Smooth out your trigger pull by polishing the contacts! Last but not least, the mystery piece! What do you think this thing does? If you've read this far, congratulations and thanks for reading all my ramblings! What is the mystery piece? It's actually an added "safety" that prevents the pistol from being loaded during disassembly. 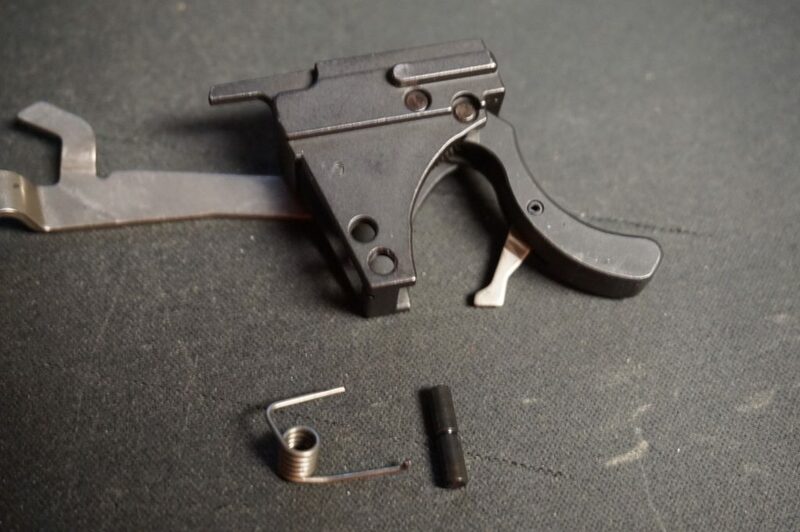 The same cutout on the lever that lets you sneak it past the retainer spring actually cams against that silver plate and moves it rearward, where a bent leg sticks into the magazine well and blocks insertion of a magazine. If a magazine is already inserted, the plate is held forward and blocks the takedown lever from rotating. 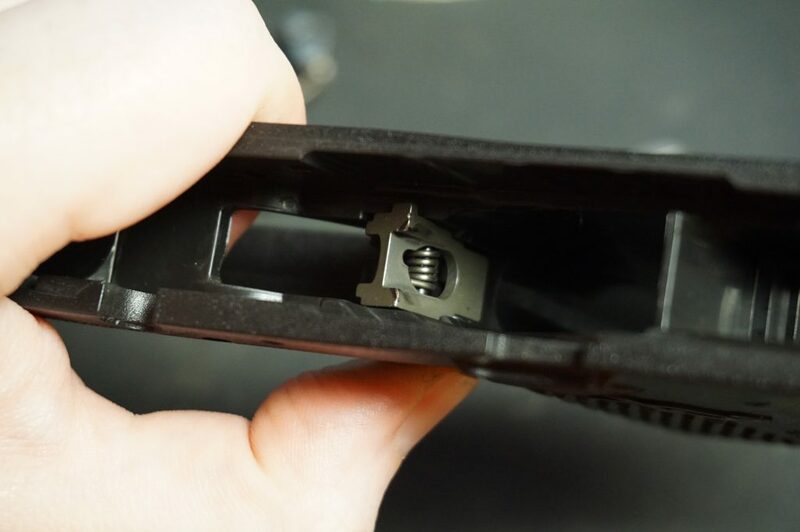 When the takedown lever is moved to the assembled (horizontal) position, it no longer blocks that plate and it can slide forward out of the way of the magazine, pushed aside by a sloped cut in front of the magazine feed lip on the right side. 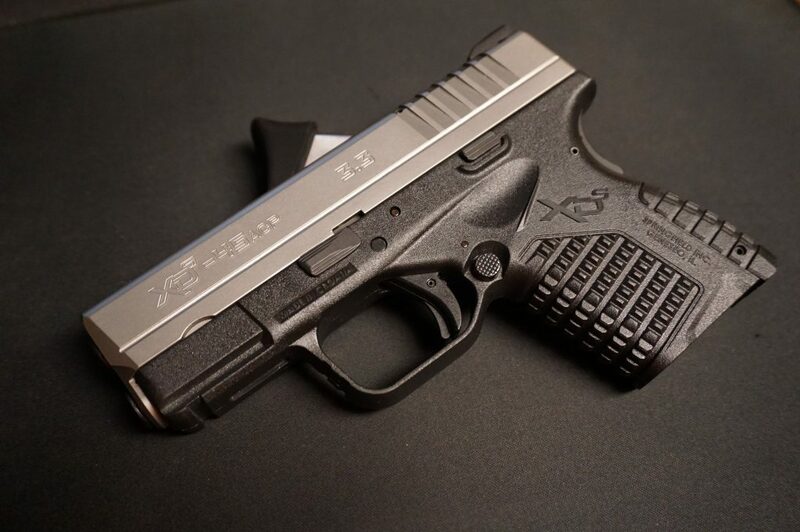 Despite its rocky start and my general dislike of grip safeties, I like the XDS and really appreciate the design details of the little pocket powerhouse. I've always thought the HS-2000, aka XD-series and XD/M were great pistols regardless of how cringeworthy Springfield's marketing can be. 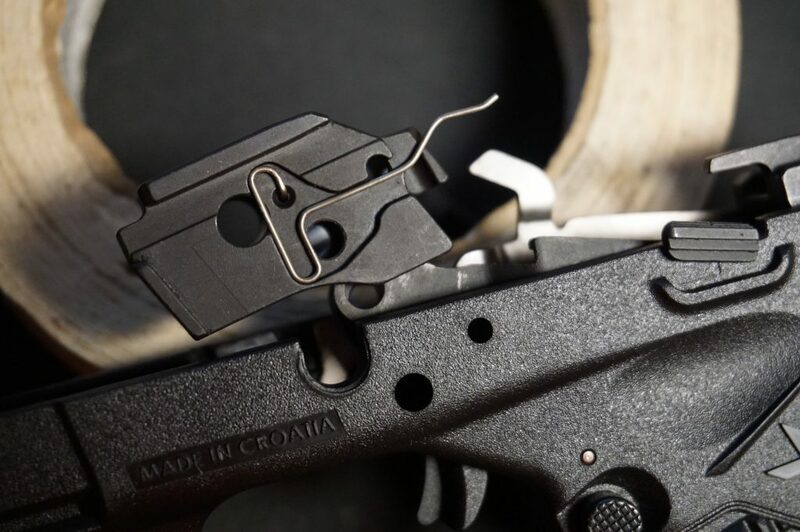 I'd love to learn more about the Croatian origins of the pistols and the actual designers who were behind the original pistols and their evolution someday. If that ever happens, I'll be sure to document it in an info post here!